(A) Left panel shows confluent BAECs were infected with low (5 MOI) or high (50 MOI) of purified adenoviruses, and the accumulation of nitrite in medium was quantified after 16 hours by NO-specific chemiluminescence. Expression of WT (myc tagged) and F92A–Cav-1 (HA tagged) was confirmed by Western blotting. Data are individual values of nitrite per 1 × 106 cells and correlate with the Western blotting data below, performed in triplicate. *P < 0.001 compared with β-gal–infected ECs. 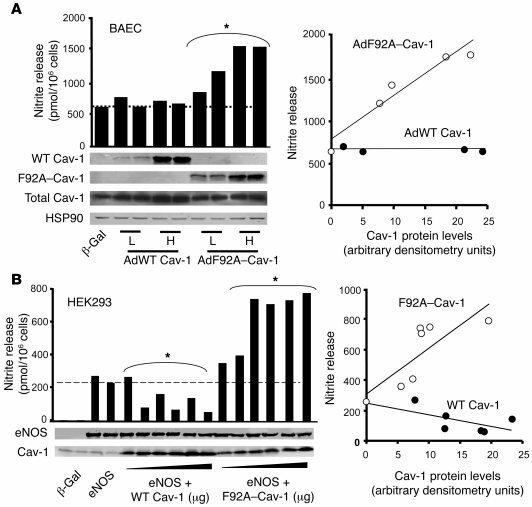 Right panel shows correlation depicting enhanced nitrite accumulation in cells expressing F92A–Cav-1 versus WT Cav-1 as a function of viral Cav-1 expression (nitrite accumulation per 1 × 106 cells/AU of Cav-1 expressed). (B) Left panel shows cotransfection of F92A–Cav-1 cDNA with eNOS cDNA increases nitrite accumulation in HEK293 cells, whereas cotransfection with WT Cav-1 cDNA decreases nitrite accumulation. Cells were transfected with fixed amounts of eNOS cDNA and increasing amount of HA-tagged Cav-1 constructs. Individual nitrite values and correlating Western blot data are shown. *P < 0.001 compared with eNOS-expressing cells. Right panel shows correlation depicting increased and decreased nitrite release from cells transfected with F92A or WT Cav-1 cDNAs, respectively. Similar experiments were repeated 2 additional times.